In the new work by choreographer Anna Mustonen and harpsichordist Marianna Henriksson the music of Claudio Monteverdi meets new dance. Monteverdi's Vespers of 1610 is an extensive collection of ecclesiastical music. The performance is a gathering of three dancers, six singers, an orchestra and the audience in the cathedral-like space of the Pannuhalli. The music of the Vespers consists of variations of ancient psalm melodies and radiating Renaissance polyphony, but also of intimate songs that seek to move the listeners internally. Also on stage there is a flux between sublime monumentality and personal everyday emotions. The choreography of the performance is guided by the notion of singing and playing a musical instrument as a dance, and of music as a power that affects the spectators’ bodies directly. Maria-vesper invites the audience to slow down and to become entranced by the melodies that vibrate, lull and flow through the bodies of everyone present. 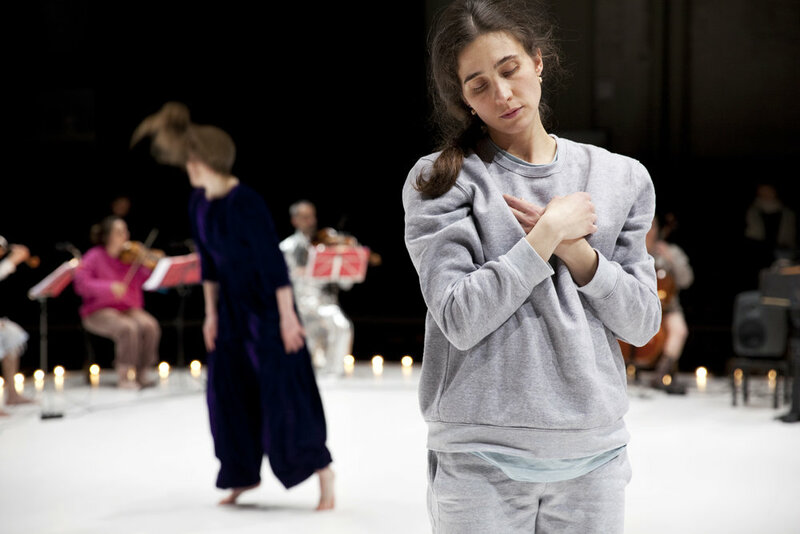 Mustonen's and Henriksson's collaboration and exploration of Early Baroque music and contemporary dance started with their previous work Di anima et di corpo, and continues with the performances of Monteverdi's Vespers of 1610, a work not regularly performed live in Finland. What kinds of collective moments of listening, dance and bodily experience will it evoke now – over 400 years after its publication? Monteverdi's Vespers like you've never seen it before! The border between singers and dancers is blurred and the result is fascinating. --- I look forward to more Mustonen-Henriksson projects. Maria-vesper is one of the most fascinating encounters of music and dance for a long time --- More of this!